Ward spoke about Jared Kushner and Ivanka Trump's influence in the White House. The author of a new book critical of Jared Kushner and Ivanka Trump's government service said Sunday on "This Week" that the couple went into government service for all the wrong reasons. "Kushner, Inc." portrays the couple -- dubbed "Javanka" by author Vicky Ward -- as forcing their will upon White House staffers and lashing out at enemies real and perceived when rebuked. ABC News obtained an excerpt of the book last week ahead of its expected Tuesday release. White House press secretary Sarah Sanders denounced the book last week in a statement, calling it "fiction." "It's sad, but not surprising, the media would spend time promoting a book based on shady anonymous sources and false information instead of all the incredible work Jared and Ivanka are doing for the country," Sanders said. Kushner's representatives also pushed back on the book in a statement to ABC News last week, writing that Ward's book is "fiction rather than any serious attempt to get the facts." (Saul Loeb/AFP/Getty Images, FILE) Ivanka Trump and husband Jared Kushner arrive to the State of the Union address at the U.S. Capitol in Washington, Feb. 5, 2019. "Jared and Ivanka famously don't like it if people don't say great things about them," Ward said on "This Week" Sunday. "I wasn't expecting them to turn around and say, 'oh, she makes some good points.'" Ward defended her reporting for the book, telling Stephanopoulos she interviewed 220 people and that while she did reference many anonymous sources, every claim had at least two sources. 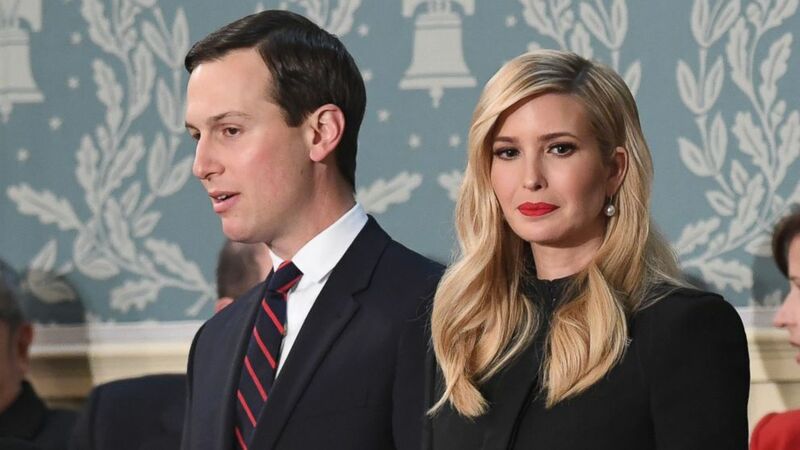 "This White House is known for knocking down anyone who reports about it and I think Jared and Ivanka are obsessed with public relations, you know, more than anyone else," Ward said. Ward also addressed the notion that the couple is a moderate influence on the president. She called this perception a "myth." "They are not the moral center of this administration," Ward said. Stephanopoulos asked, "You think they are enablers?" "I think they are almost worse than enablers," Ward responded. "I think that most people go into government for public service. I think they've gone into self-service." Stephanopoulos said, "And that gets to what really is the most loaded charge, it's right on the cover of your book, corruption." Ward pointed to a meeting between Kushner and a major Chinese insurance firm on the first weekend of the transition to discuss the sale of a building in New York, saying the timing created "the appearance of corruption." She said Kushner didn't disclose this meeting to anyone else on the transition team, and at the same time was involved in meetings with Chinese officials on behalf of the Trump transition at the same time. ABC News previously reported on Kushner's efforts to solicit buyers for a building at 666 Fifth Ave.
Ward called this "the appearance of corruption."